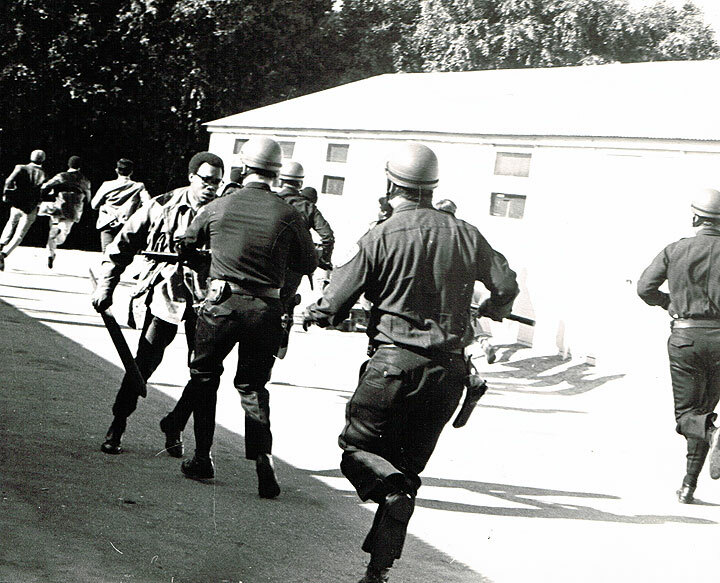 Nesbit Crutchfield faces off against San Francisco police on Nov. 13, 1968. When most Californians think 1960's, meaning peace, love, dope, & riots on campus, they immediately think of Berkeley. But the real University of the 60's was Berkeley's less-famous neighbor, San Francisco State. You want drugs? Though So-Cal parents refused to send their kids to Berkeley because of its druggie reputation, San Francisco State was to Berkeley what 500 micrograms of LSD is to a toke of cheap Mexican weed. SF State was the home of the Psychedelic Research Institute, a Psychology Department spinoff that experimented--successfully, in many cases--with using LSD as a problem-solving tool. Parallel to the official experimentation was a huge network of private users, who turned on their friends, until San Francisco State became, according to Tom Wolfe, "the acid-head's true university--sort of the way Ohio State is for football freaks." You want protests? In 1950, seven SF State faculty members resigned rather than sign a McCarthyist loyalty oath mandated by law. Then in May, 1960, hundreds of SF State students kicked off that tumultuous decade by staging a peaceful sit-in in City Hall to protest the visit of the House Un-American Affairs Committee. They were beaten, brutalized, and washed down the steps of City Hall with fire hoses by thuggish cops--a foreshadowing of the police riots that erupted regularly throughout the decade. By the late 60's, SF State had become the most tumultuous campus in America. A wave of protests erupted, triggered by everything from the Vietnam war to racism to bad food in campus dorms, and climaxing with the events of 1968--America's first and longest-lasting student strike. You want hippies? In Stephen Gaskin, longhaired guru of peace, love, understanding, mind-expansion, telepathy, astral travel, vegetarianism, and lots of other neat stuff, began teaching an unofficial Monday Night Class in the student union. Though at first his class only attracted a handful of curiosity seekers, Gaskin's love-fueled oratory was so powerful that dozens, then hundreds, and eventually thousands of people became his followers; the class had to be moved from SF State to a rock amphitheater. Eventually Gaskin and company bought a fleet of old school buses and drive across the country in search of a mellower place to settle down. They wound up in Tennessee, where residents at first didn't cotton to the transplanted San Franciscans: Gaskin served jail time after marijuana plants were found on their land. But the hippies soon proved themselves good neighbors, and as of this writing the Farm is still thriving in its utterly un-San Francisco-like environment. Meanwhile, the top of the Student Union, which looks like a bauhaus version of the pyramid of Cheops, still serves students as an ideal site for sexual and psychedelic dalliance.